A Great Birthday Party Idea in Raleigh! Hire this quality magician! birthday party idea worth it? 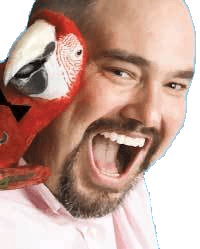 Let’s not forget about gentle giant parrot Jax – yes a real parrot! Amazing Captain Kid is a great quality party idea because . . .
Captain Kid is an incredible party idea because he is dependable and punctual. What good is a magician that is not? This means scheduling parties with enough space that one can reasonably expect to be on time for all. Captain kid has a wonderful birthday party ideas in Raleigh because they are stress-free and do not create a mess. No worries about kids destroying your home, they are fully engaged during the show. There is no mess to pick up after the show, Captain Kid leaves the room as it was when he came. He is an awesome party idea because the kids will be crazy about the show, but kept under control – Captain Kid has lot’s of experience doing this! There is also full audience participation (if they wish) for up to 20+ people. You ill love this Birthday party idea because parents often say “Best Party. Ever.” when they talk about his personality-driven show. Captain Kid is the best party idea because he uses only “organic” props for more impact. Props that are, or look like regular, everyday objects are much more believable and fun! Jax the parrot is truly a gentle giant and is a great birthday party idea! Raised by hand by Captain Kid since she was a little chick, Jax loves the limelight and performing! Captain Kid is a true comedian who does magic. His shows are full of laughter for the kids and adults!